This blog explores 12 reasons Bohol Divers Club does not visit Oslob Whale Shark feeding activities. Details of alternative places where you can see whale sharks naturally in the Philippines are revealed below. Oslob is a municipality on Cebu Island, which was transformed into the hub of a major tourist attraction. When the locals discovered that they could lure whale sharks with bait and earn money from tourism by doing so. Feeding. Shrimp (e.g. family Sergestidae) are traditionally caught at night and used for human consumption and as bait in hook and line fishing. The sharks would approach hook and line, trying to feed off the bait, locally known as Uyap. As the sharks interrupted fishing practices, fishermen from the village of Tan-awan, in Oslob learnt to lead them away from the fishing activities by luring them with Uyap. Word soon spread and people started visiting Oslob, paying the fishermen to take them out to see the whale sharks. Social media sites were flooded with photos and videos of people getting up close to the sharks. Further media coverage contributed to international awareness of the practice in 2012. Since then the industry has grown huge with over 100,000 tourists visiting the site every year. Previously whale sharks were hunted for their meat and fins, leading to them becoming an endangered species. Whale sharks are listed as Endangered to extinction by the International Union for Conservation of Nature (IUCN), CMS Annex 2 and are listed on Appendix II of the Convention on International Trade in Endangered Species (CITES), which bans their trade. United Nations Environment Programme (UNEP) has deemed the Oslob Whale Shark feeding activities as an unsustainable tourism industry. Tourists are briefed to stay 2m from the head and body, and 5m from the tail, following a Local Ordinance regulating the tourism. Other rules regarding interacting and not touching the whale sharks should also be briefed to visitors. The degree to which these rules are briefed to visitors varies and visitors frequently ignore the rules and make contact with whale sharks: touching them, holding them and even trying to ride them! Feeders feed the whale sharks between the outriggers and hull of the boat, bringing the whale sharks in close proximity to boats and visitors. The whale sharks often collide with boats as they try to feed and feeders push them away with their feet. Feeders have also been observed throwing Uyap at people to lead the shark closer to them. As a result, the sharks have learnt to associate boats and people with food and now actively approach them, even in the absence of food. The whale sharks at Oslob display lesions around the mouth. These lesions, that appear mostly white and have a spongy consistency, are the result of repeated rubbing against the side of feeder boats. White scars can also been seen on the leading edge of the first dorsal fin, where the abrasion is due to the contact with the hull and outrigger of the paddle-boats. None of the new sharks that arrive in Tan-awan have any sign of these lesions or scars and it takes less than a week of feeding from boats to develop them. 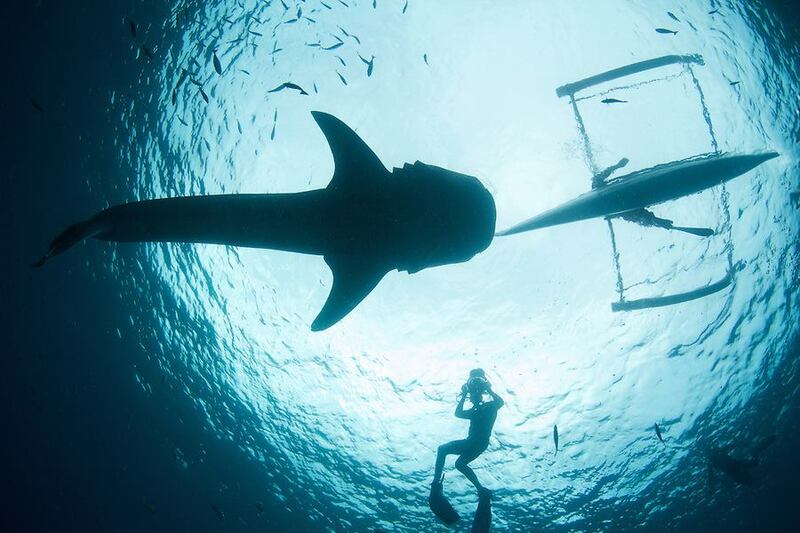 Whale sharks in Tan-awan have been seen with propeller scars of varying degrees of severity. These scars are on the back of the head or body of the shark indicating a propeller boat passed over them whilst they were near the surface. Researchers have observed sharks approaching guest boats, empty paddle-boats and dive boats, bumping them, as they would do with a feeder boat when searching for provisioned food. This indicates that whale sharks do not differential between types of boats. Observations of sharks approaching boats have increasingly been reported from other nearby municipalities showing that the behavior learnt in Oslob is displayed outside the interaction area. If the sharks become accustomed to spending more time in shallow waters to feed and interact with boats this increases the chance of contact with boat propellers. Data from satellite transmitters attached on whale sharks have shown that several sharks migrated to countries like Indonesia where the whale sharks are still legally hunted, as well as countries like Taiwan and Malaysia where poaching is still common. 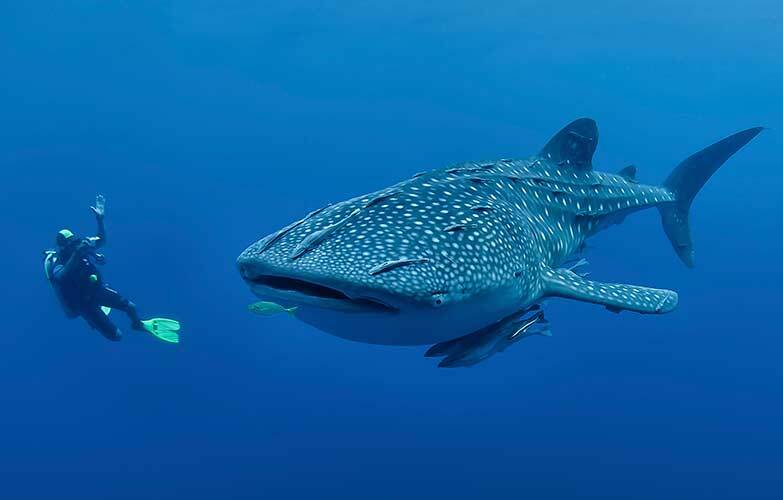 Encouraging whale sharks to interact with boats and people increases the risk of injury, by catch, and poaching and hunting if the sharks migrate to countries where these activities still occur. The positive association the sharks have made between boats and food is one of the most dangerous aspects of the feeding practice. Naturally whale sharks migrate over thousands of kilometers and usually only stay at Oslob for around 60 days. The whale sharks at Oslob, which are mostly juvenile males remain in the areas for many months at a time. One whale shark named Mr Bean was recorded to stay in the area for 392 days. This behavior changes their migratory patterns to other feeding sites and breeding grounds, which reduces their chance of mating and reproducing. Operators at Oslob use the argument ‘Better fed than dead’, insinuating that if the whale sharks were not fed they would be hunted/killed. This argument is untrue; before the whale shark tourism started, the whale sharks were not being hunted. Fishermen lured them away with Uyap, so that they could cast their nets without the sharks getting in the way. Whale sharks have been protected since 2007. The Philippines became one of the first countries in the world to initiate national whale shark protection. Fisheries Administrative Order No. 193 prohibits the take, catch, sale, purchase, transport or export of whale sharks (and manta rays) whether dead or alive. It also prohibits wounding or killing whale sharks. The penalties issued to offenders include fines up to five thousand pesos (PHP 5,000) and/or imprisonment of up to four years. Naturally whale sharks can feed over hundreds or thousands of kilometers, migrating to different areas to find food sources. At Oslob the fishermen over fished Uyap locally to bait the whale sharks. Fishing locally has been banned and bait now needs to be imported from other areas in the Philippines. The imported bait known as Uyabang is larger in size and white in colour and has been reported to be bought from as far away as Iloilo (~110km). Uyabang is bought in bulk and kept on ice in Styrofoam boxes. Some of the fishermen have reported that on occasion, some sharks refused the food if older than five days. Naturally whale sharks migrate to different feeding grounds feeding for an average of 7.5 hours per day on a range of food including sergestid shrimp, calanoid copepods (zooplankton), chaetognaths (arrow worms), and fish larvae. In contrast, the whale sharks in Tan-awan are fed solely with shrimp for an average of 8 hours a day. Storing bait on ice for several days reduces its nutritional content. Researchers estimate that due to the inefficient nature of feeding from a boat, the sharks consume only 30-50% of what is put into the water and it is common to swim through a “cloud” of uneaten shrimp in the water. As the price of Uyabang increases due to being overfished for this activity, feeders have been seen to withhold food from the whale sharks to minimize its usage. Due to lower quantities of food ingested and the lower nutritional value of the food, their biological requirement for growth will not be met, delaying growth and time of maturity. Delayed maturation will affect the reproduction of these species. 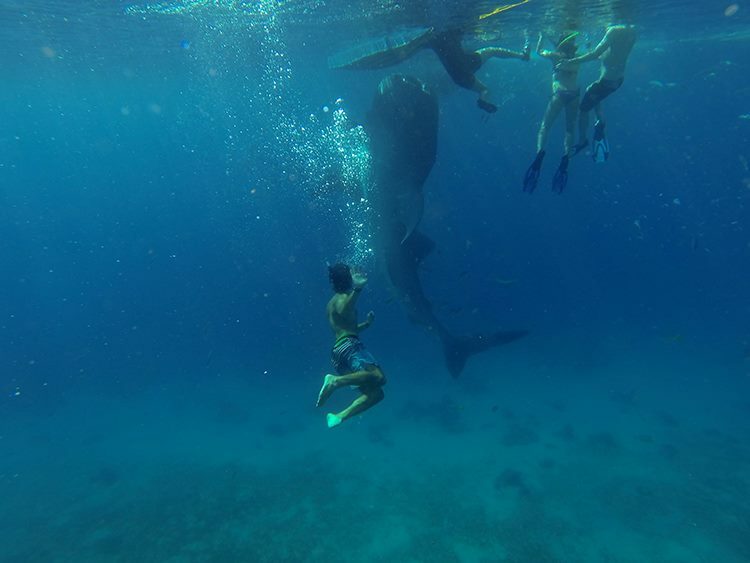 There is currently little to no educational value to the whale shark experience in Oslob. The briefing contains no information about the animals; the biology and conservation of the whale shark or why it is important to respect the rules. There are no educational materials provided by the local government and even the road signage contains the wrong information indicating the interaction area as “whale watching” (whale sharks are sharks, part of the fish family, not whales, which are mammals). Anchoring of boats as well as visitors sitting and walking on coral reefs has pulverized it into coral rubble in some areas. Several species of fish have been observed feeding on Uyabang not consumed by the shark including fusiliers, moon wrasse, Scrombidae sp, butterflyfish, rainbow runners, and damselfish. Another negative effect of the feeding is the unintended provisioning of reef fish that have important functions to perform to maintain a healthy reef ecosystem. If reef fish are feeding on the Uyabang, they are not performing those functions, which for some species includes feeding on the algae and grazing on seagrass beds maintaining the health of the ecosystems and increasing the level of oxygen present in the water. Monitoring of whale sharks in Donsol, Sorsogon, through satellite tagging shows that whale sharks spend more time in deep waters. Aside from feeding, there are studies suggesting that whale sharks dive deep to rid themselves of parasites, clean their filter plates, and ‘sleep.’ Preventing whale sharks from spending time in deep waters will affect important biological activities. Data collected at Oslob shows that the whale sharks spend a great deal of time at the surface in shallow warmer waters, while being fed. This means that they are constantly exposed to warmer waters and surface currents. This will require more energy from the sharks, causing stress, which makes them more vulnerable to disease and interferes with biological processes. Whale sharks can be seen in many areas of the Philippines, including popular diving and snorkeling destinations. As these are wild animals spotting them is not guaranteed, however two hot spots where whale sharks can be seen naturally are Donsol, in Luzon and Sogod Bay in Southern Leyte. In these areas local fishermen have been employed as spotters of whale sharks. Not only does this provide the local community with an income, but is also means that these fishermen are fishing less in these over fished seas. The Donsol and Sogod whale shark watching activities are overseen by conservation NGOs WWF Philippines and Large Marine Vertebrates Research Institute Philippines (LAMAVE) respectively. These groups liaise closely with the local government and communities, to ensure the activities are run in a sustainable way. A lesser known spot is Honda bay, Puerto Princessa, in Palawan. Sustainability run whale shark watching operations; allow visitors to see them in their natural environment; benefit the community with income generated and education provided; gives scientist the ability to study them to improve our understanding; increases their protection as communities and governments see the benefits from long-term sustainable tourism income. Seeing whale sharks in the wild is seasonal, so plan ahead to have the best chance of seeing them. For more information contact operators in these areas to see how frequently they are spotting the whale sharks at the time. Whale sharks generally arrive between November and June, peaking from February to April. In Donsol during peak season it is very rare not to see whale sharks. Most people will see at least 5. It is best to book ahead during peak season, as this is the busiest period. The whale shark season in Southern Leyte usually starts around early November and runs through until the end of May, but can end much earlier without warning. Enquire ahead to check sightings. Whale shark season in Puerto Princesa is from April to October.